Third-grader Shunsuke's life is a little bit strange, but it's peaceful enough... until he comes home from a visit to his grandparents to find his town a desolated wreck, his babysitter a mindless monster, and his mother a bloody corpse at the door. Shunsuke escapes to his clubhouse, and meets the remaining population of Kowada Town: six terrified children who just want to call for help. And then there's Yuuichi, the little boy behind it all, whose bizarre demands offer a promise of escape. Can you save your friends, or will you be left all alone? Re:Kinder, a free RPG adventure made by Parun and translated by Vgperson, might sound like a relatively straightforward horror story... but no, that's not the case. It's just that the sheer level of weirdness in this game is difficult to convey with words. Guide Shunsuke through what remains of Kowada Town, solving puzzles and figuring out the right course of action before it's too late and one among your number is gone for good. When the party needs to fight, you'll be dropped into a turn-based battle. You'll need to pay attention to the characters' abilities and the enemies' patterns of attack— trying to brute-force your way through a battle is the quickest way to lose. Though the combat is far from the star of Re:Kinder (there's no levelling and only one weapon upgrade, and veteran explorers may find a way to skip the final boss entirely), it does an admirable job in its supporting role. Sometimes the gameplay gets weighed down by all the cutscenes, but that's pretty much par for the course in this type of game, and thankfully, Re:Kinder includes the option to skip dialogue. It's not quite as elegant as the skipping system found in, for example, Renpy games, but it is much, much better than nothing at all, and it definitely improves Re: Kinder's replay value. Kowada Town is a great setting, with oddly-named stores and a park that's only there because the two towns who planned the thing didn't want it, and Shunsuke's friends are for the most part a likeable crew. Not everyone gets enough time to shine, but they work well together as an ensemble, and for me, keeping them all alive wasn't just about winning the game— I genuinely didn't want to see them go. The whole game is teeming with a strange sense of personality, leaping back and forth across the line between tragedy and comedy. Sometimes you're listening to a precocious child babble about sperm and adultery, sometimes you're listening to a depressed child tell you about how they want to disappear (a recurring theme in Re:Kinder, which takes place in a world with very little understanding of mental illness, and quite a few of the characters suffer for it). You learn to roll with the mood whiplash after enough exposure to it, even if it's never quite comfortable. Some games don't seem to know what they want to be, but not this one. Re: Kinder feels more like a game that knows itself perfectly well, but doesn't want to open up to you about it. It's very aware of what it does with game conventions, and it cultivates its unique style of odd in a way that seems... carefully halfhazard, if that's a thing. Re:Kinder is, as the name implies, a remake of a previous game by Parun, simply titled "Kinder." Kinder hasn't been translated into English, and Vgperson hadn't been able to find it at the time Re:Kinder's translation came out. 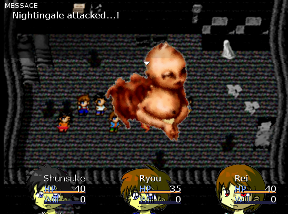 Some accounts of Kinder mention that the black comedy so prevalent in the remake was completely missing in the original game (link is very, very spoilery). It was a deliberate choice to make this game undermine itself so much, and it begs the question: why? Did Parun think his old game was silly, or needed to be lightened up? Was the comedy for the sake of dissonance; a way to make the creepiness pop? Did he just want to troll the players? Perhaps it tied into the themes of the game— Shunsuke is traumatized by the horrors he faces, but the story's tone doesn't change for him. It's eerily reminiscent of the way that certain characters sought help repeatedly for their problems, but were met with indifference every time. Sadly, Parun passed away in 2011. Given the circumstances of his death, it's possible that his writing on depression came from somewhere personal. It's tempting, though reductive, to see this game as an explanation of sorts. I don't think it's that simple. Re:Kinder has a message, but it isn't only a message. It's a weird, creepy, funny game about struggling to survive and the hidden depths in people— even the ones you've got every reason to write off. Re: Kinder isn't for everyone, but if you're looking for something a little unconventional, you might want to give it a chance. I've tried to put spoilery directions behind tags, but it's still a good idea to, at least for your first playthrough, avoid reading beyond your current place in the game. Re: Kinder can be a very surprising game, and I personally think the experience is best if you don't know what's coming. The Tips section doesn't contain any spoilers at all, if you're looking for non-spoilery help, and the Town Map section can help you orient yourself if you're lost (the unmarked version is best if you're strictly avoiding spoilers, but neither are that spoilery.) I also recommend that you wait on the Endings Guide until you've finished the game at least once, and definitely don't read the "What happens" sections unless you'd like the endings to be spoiled for you. There are no color puzzles in this game. One of the images I provided uses color-coding, but it's paired with symbols. Save often, especially before doing something that seems like it might be dangerous. If you're not sure about something, save to a different file. You have 16 save slots, make the most of them. Trial and error is your friend! If you or one of your friends die, try not to get frustrated. A lot of deaths in this game are difficult to see coming on a first playthrough, but more easily avoided when you know what's coming. As long as you learn from your deaths, you're making progress. The party's abilities are important. If you're stuck in a battle, abilities are usually the key. Look at each of your party members, and see if anyone's ability could help with the problem you're facing. Many of the enemies you fight have a pattern to their actions. If an enemy has a powerful attack that keeps killing you, try looking for a pattern and finding a way to stop the attack or reduce its damage. Examine everything and talk to everyone, and don't be afraid to explore. 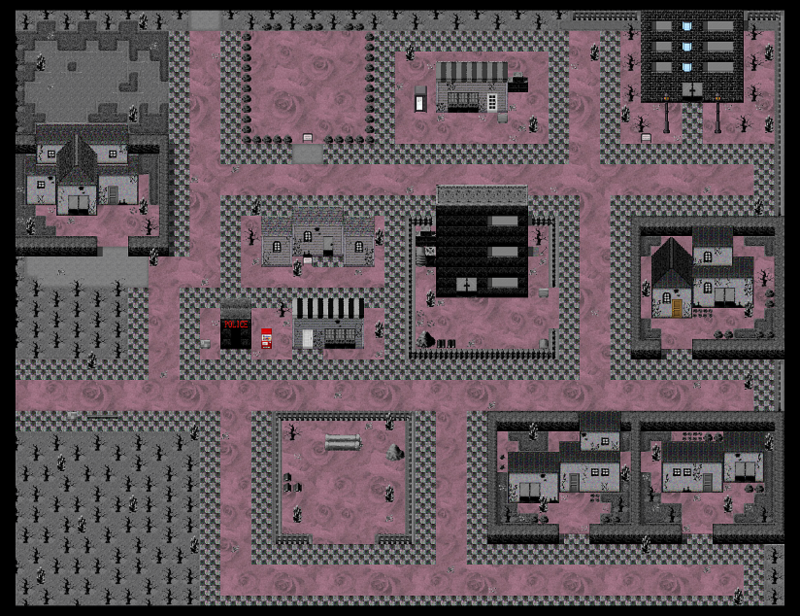 This map doesn't have labels, and is recommended if you'd like to see the layout of the town all at once to get yourself oriented, but would rather not see any spoilers. This map has a label for every named or significant location. It's not incredibly spoilery, but some places are going to stand out as significant. Recommended if you're having trouble finding anywhere in particular. Note that normally, a secret item is visible from the main town. It doesn't appear in these maps, but the "Before the final battle" section in the walkthrough covers finding it. After the scene, go downstairs. Approach Shunsuke's mother, the woman in the kitchen. You'll arrive outside. Approach Mami, the older girl standing on the sidewalk. After talking to her, go west. You can talk to the people milling around near the bus stop if you'd like, but it isn't necessary. Read the sign, then take the road north to the Secret Base. It's useful to talk to all of the kids, but you only need to talk to Ryou and Sayaka, the two hanging out at the northeast corner. Akira, at the northwest, is next to a sign that explains the battle system, and Chie, near the southeast, will explain how to skip dialogue (if you ask her to stop meowing, that is.) Jumping off the bed in the southeast corner will kill you. Once you've talked to Ryou and Sayaka, leave the Secret Base and return to the bus stop. The people in the area have new things to say, but again, talking to them isn't necessary. Examine the sign again when you're ready. After a long scene, Shunsuke will be caught in a battle. There's nothing you can do, so just sit back and wait for rescue. Unfortunately, saving her is impossible. Don't worry about going back and doing something differently, because there's really nothing you can do. You'll regain control one screen south of the Secret Base. Note that Chie's cat is near the north end of the path, and dispenses the same information as Chie did previously. He'll be there for the rest of the game if you need a refresher. When you regain control, talk to everyone. Note that while Akira is gone, the sign that explains the battle system is still in its place on the wall, if you missed it the first time, or if you'd like to read it again. The bed is also still around, and jumping off of it is still deadly. After you've talked to Ryou, Sayaka, Rei, Hiroto, Takumi, and Aya, talk to Ryou again. The group will decide to go to the public phone near the Hag's Shop and call for help. Leave the Secret Base, and go south until you reach the main town. Keep going south, but go east at the first possible opportunity. Keep going past Nippoyo Heartful Park (you'll see some bushes and a sign), and the next building will be the Hag's Shop. The public phone is just west of the store proper. If you can't find it, check the Town Map provided in this walkthrough. It isn't necessary, but you might want to check the menu to see what the game says about Takumi. Examine the phone booth. Like Mami, Takumi always dies. There's nothing you can do differently to save him, so don't worry about finding a way to keep him alive. After the scene, head back to the Secret Base (west until you reach a street going north, then north until you arrive.) It isn't necessary, but you might want to check the menu to see what the game says about Yuuichi. You also might want to save before you go inside the Secret Base again. If you want to explore the town a little bit before you go back, there are several interesting things you can find, including a vending machine. From the road to the Secret Base, keep going south until you see the Police Box. Right to the east of it is a bright red vending machine. You can buy some healing items and a few other things, but you don't really need to mess with it yet. Healing items are pretty unnecessary at this point in the game, and you've already got a few. Once you arrive at the secret base and the scene is over, you'll be dropped into your first real battle. You're not going to be able to just Bash your way through the battles in this game, and even though this is the first where you can actually do anything, it's no exception. Ryou's ability, Share Candy, restores 15 HP to the whole party. Keep Ryou healing, and have Rei and Shunsuke attack. Rei's Hysteria ability doesn't work against Nightingale, so stick to Bashing it until it goes down. After the battle with Nightingale, Sayaka will freak out and run away. Before you go looking for her, you'll need to pick a party member to accompany you. Nobody's really a terrible choice. The upcoming battle isn't very difficult, and all of them have their strengths. Ryou's ability is very useful. Unless you're really unlucky, he's a pretty sure bet. Aya's ability is probably the most useful. You'll need to be a little more exact than with any of the others, but if you use her correctly, you basically can't lose. Personally, I like taking Aya. However, if you're on your first playthrough and/or inexperienced with these types of games, I'd recommend Ryou. Once you've decided on someone, leave the Secret Base and go back to town. Sayaka's house can be reached by following the road south to the Police Box, then taking the east road until you reach a dead end. Sayaka's house is directly to the north, and has a light brown door. Examine it. You may want to save before doing anything else. Sayaka's still safe when you arrive at her house, but you'll need to find a way to get to her quickly. Examine the door too many times, and she'll be a goner. You need to do something else. Might there be another way to get inside? Examine the window of Sayaka's house. It's still open, and you'll be able to go inside. Go up the stairs for a battle. The winning strategy completely depends on who you brought along. Think about what your party member can and can't do, and plan accordingly. To be more specific, is their ability going to be useful in this fight? And if not, what other skills might they have to offer? Hysteria doesn't work on Cruel Teddy, so have both Rei and Shunsuke Bash until Cruel Teddy is defeated. Rei has a relatively high attack stat and a high critical rate, so Cruel Teddy will probably run out of HP before your party does. Shout does nothing to stop Cruel Teddy from attacking, so have both Hiroto and Shunsuke Bash until Cruel Teddy is defeated. Hiroto has a high attack stat, so Cruel Teddy will probably run out of HP before your party does. Have Shunsuke Bash, have Ryou Share Candy when necessary. Have Shunsuke Bash. Have Aya open with Dark Gaze. When Cruel Teddy is feeling glum (one turn after a successful Dark Gaze), have Aya Bash. When Cruel Teddy is back in good spirits, have Aya use Dark Gaze again. Dark Gaze sometimes fails, but it usually doesn't. Still, when Aya contributes damage, you'll get the battle over with much faster, and that's decent insurance against a bad Dark Gaze or two. After, go back to the Secret Base. Once you've returned with Sayaka, you might want to talk to everyone, but you only need to talk to Hiroto to advance. After, leave the Secret Base, go back to town, and head for Nippoyo Heartful Park. If you remember how to get to the Hag's Shop, the park is on the way. Go south until the first path east, go east until you see the bushes and sign, and you're there. Slip past the sign and go into the park. You might want to save. Talk to Hiroto if you'd like, then talk to Ryou. Think about what Shunsuke can do, and what the other characters can do. If Shunsuke can't hang on to Ryou, is there someone else around who can? But time is still of the essence. Don't examine Ryou after he gets grabbed. Instead, go talk to Hiroto. You won't have time to explain, so just take him to Ryou. The fight with Rapunzel is incredibly easy. Just keep Bashing, and it'll go down in about 4 turns. Inside the dome, it's time for a battle. Heart of the September Rain is unsurvivable by two thirds of the party. Wasn't there a way to reduce the damage a character takes? Princess Hanauta Mitsugi doesn't use that attack randomly. How can you tell when it's coming? Princess Hanauta Mitsugi's attacks follow a set pattern. Two turns after you see the "Princess Hanauta Mitsugi's heart beat loudly" message, she'll use Heart of the September Rain. When that turn comes up, have everyone Block. The attack is still an annoyance, but it won't kill most of your party on the spot. Have Ryou use Share Candy after Heart of the September Rain, and any other time when a party member's HP gets below 20 or so. Hiroto's Shout ability doesn't have a noticeable effect on Princess Hanauta Mitsugi, so any time someone isn't Blocking or Sharing Candy, they should Bash. Once the scene is over, go back to the Secret Base. You might want to talk to everyone, but you only need to talk to Rei to advance. After, leave the Secret Base, go back to town, and head for the lot with the pipes. To get there, go south past the Police Box, a few steps east, then south as far as you can go. The lot with the pipes is just a little bit east from there (it looks empty from there, and it's surrounded by a fence.) You might want to save before going inside. After the scene, you'll have 40 seconds to find Aya. While you may need the whole 40 seconds to find Aya, you won't need that much time to reach her-- especially if you remember how to go faster. Aya's location is not randomized. If you know where she is and you're still having trouble getting there in time, consider whether everything the game throws at you on the way is really mandatory. Leave the lot and go west until you reach the corner, then north. Go west around the police box, north again, then west again at the first intersection. Go into the yard of that house, and Aya will be there. Dashing is recommended. This image shows Aya's location. When you hit a random battle, run away as soon as you can. There isn't time to fight. Whether you succeed at saving Aya or not, you'll get a scene when you find her, and you'll regain control in a house. Examine the refrigerator to get an Unmelting Cheese. Next, examine the laptop on the table in the south room to lower the spikes, and then go up the stairs. Take the southwest exit. Examine the diary on the table and choose to read it (as well as the letter at the end), examine the bookshelf (either side), and examine the TV (at the northwest corner of the room.) Leave the room, and this time, take the northeast exit. You might want to save before you examine the corpse. After the scene comes another battle. Cassiopeia is unsurvivable, even if you block. Is there a way to stop it from happening at all? Yuuichi has a lot of health. Is there anything you can do to deal more damage per turn? On the first turn, have Aya use Dark Gaze, if she's alive. If not, have Shunsuke use Stick Out Tongue (an ability that's exactly the same as Dark Gaze, and only available if Aya is dead.) Have Shunsuke use Pacify on Rei as soon as possible (the first turn if Aya's around, the second turn if she isn't). Rei's Hysteria ability works against Yuuichi, so spam it for the remainder of the fight. If Aya's around, have Shunsuke Bash, and have Aya use Dark Gaze when Yuuichi is in good spirits and Bash when he's glum. Otherwise, have Shunsuke use Stick Out Tongue when Yuuichi is in good spirits and Bash when he's glum. You might want to talk to everyone, but you only need to talk to Hiroto to advance. After, leave the Secret Base, go back to town, and return to the Hag's Shop (south until the first road east, then east until you see the corpse in the phone booth, then into the building just east of the phone booth). You'll automatically pick up the Food for Everyone. Before you leave, there are some other items in the shop to find. A Diamond Bell is on the second shelf from the left in the row of shelves at the north wall. Two Maple Cookies are on the second shelf from the right in the northeast block of shelves. You might want to save before you attempt to leave the store. After, it's time for another battle. Mysterious Pleasure restores all of Princess Hitokata Sakuragi's health. You'll need to either defeat her in one turn, or find a way to stop her from using the attack. Only one of these is possible. Lamentations of a Mermaid isn't survivable. Is there anyone in the party who can stop it? The Diamond Bell prevents Princess Hitokata Sakuragi from healing, and Hiroto's Shout ability lowers her willpower enough that she can't use Lamentations of a Mermaid. Have Hiroto use Shout on the first turn, then have either of the others (preferably Shunsuke, since Rei hits harder) use the Diamond Bell. After that, have everyone Bash until she's defeated. After the scene, you'll be exploring a slightly different version of the town... and you're not Shunsuke. Find and examine every sparkling star cluster in town, then watch the related scene. There are six in all. At the door to Yuuichi's house. At the entrance to the park-like area north of Yuuichi's house. At the door to the Bookstore (the building just east of the Police Box). At the door to Amore Medical (the building just north of the Bookstore). At the opening in the fence around the Abandoned Building (the building just west of Sayaka's house). This image shows the where the stars are found. After you've found them all, you'll be Shunsuke again. Leave the Hag's Shop and head for the Aneha Apartments to the east (look for the two big street lamps). Go inside. Make your way up to the top of the building. Each floor expands to the west, but in most, the doors in that area are locked. Floors 2, 4, and 6 each have an unlocked room. You might want to explore the others, but to advance the game, you need to go inside the unlocked room on the 6th floor. After the scene, make your way back down to the first floor, but again, you might want to explore the other rooms first, and you really might want to save before you go all the way downstairs. Once you reach the first floor, there'll be a scene, and you'll need to free Rei from the elevator. Have you explored the unlocked rooms on floors 2, 4, and 6? Have you found all three password clues? *Hint: Figuring out the right numbers is as easy as ABC, 123. *Hint: When in doubt, look down for an answer. You'll need to solve for both the number and the position of the number in the password. You'll also need to look at a standard keyboard. Read the password clues in the unlocked rooms on floors 2, 4, and 6. The clue on floor 2 is in the note on the table, the clue in floor 4 is on the TV at the back of the room, and the clue in room 6 is on the refrigerator. The special characters can be easily mapped to numbers (based on the shared keys)-- @ = 2, # = 3, ! = 1. These represent the position of the number in the password, so the number derived from B is first, the number derived from F is second, and the number derived from C is third. The letters aren't quite so obvious, but they can be mapped to numbers-- F = 6, C = 3, B = 1. Put it together and the password is 2, 6, 3. Enter this series of numbers when prompted, and Rei will live. After the event, it's a good idea to save again. You'll now be Hiroto, and after a scene, you'll have to battle. You're not going to be able to beat her in a straightforward fight. Is there anything you can do to get out of there? Hiroto has some new abilities in this fight. 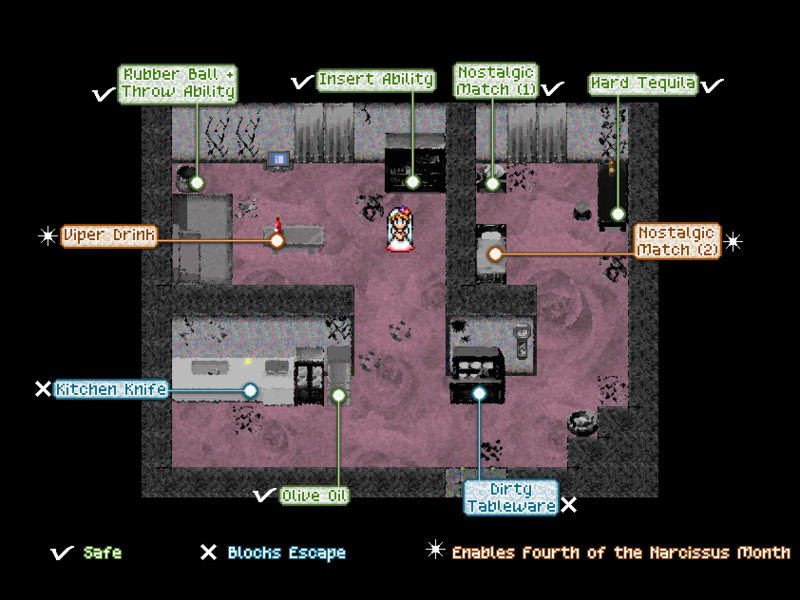 The room is full of items (and abilities to learn), and some of them can be used to defeat Princess Utsuroi Momogi. But watch out, because some of the items enable Princess Utsuroi Momogi's Fourth of the Narcissus Month, an unsurvivable attack. Others take away your ability to escape. You'll need two new abilities and three items from the room. If you find a way to use items and abilities to harm her, but she still isn't dead, you're on the right track. Consider if there's something you can do to make this method more effective. Use Hiroto's new Aim for the Eyes ability to escape, then explore the room. You'll have 15 seconds before Princess Utsuroi Momogi attacks again, but as long as you haven't taken an item that removes the effectiveness of Aim for the Eyes or enables Fourth of the Narcissus Month, you can just Aim for the Eyes and escape again. This image shows the locations of these items, and their effects. To defeat Princess Utsuroi Momogi, get the Olive Oil, the Hard Tequila, the Nostalgic Match (the first, non-crumbling one), and the Insert and Throw abilities. First, use the Olive Oil on Princess Utsuroi Momogi. On your next turn, Insert the Nostalgic Match into the Hard Tequila to get a Molotov Cocktail. On the turn after that, Throw the Molotov Cocktail at Princess Utsuroi Momogi. You may also want to pick up the Kitchen Knife, since it's a better weapon for Hiroto and boosts his already high attack stat even higher. (No, you cannot give it to somebody else.) Make sure you only pick it up after you have everything else you need, though. If you lost the battle, you'll now be Shunsuke. Go west, and examine the south wall at the end of the trail. Depending on what you've done previously, you may get an ending right away. If you won the battle, you'll be Shunsuke again after a scene. 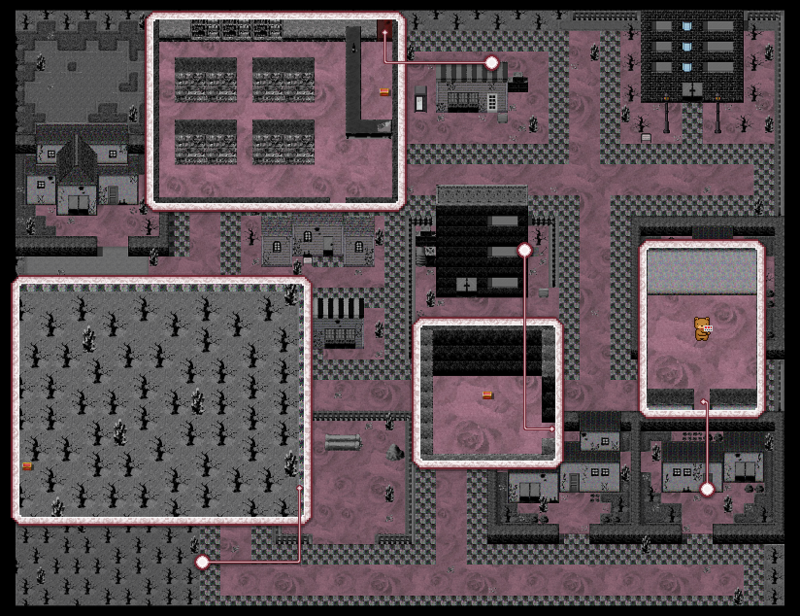 Either way, there's nothing more to do in the Aneha Apartments, so return to the Secret Base. Depending on what you've done previously, you may or may not be interrupted by Sayaka and Ryou along the way. If you aren't, go all the way back to the Secret Base for an ending. If you are, the game continues. After the scene with Sayaka and Ryou, go to the Police Box. Examine the sparkle to get the Prajna Keychain. While you're there, you might want to stop at the vending machine. If you try to buy Rust Remover when you can't afford it, the vending machine will spit out some Rust Remover anyway (might that mean that the Rust Remover is important?). It's recommended to spend all your money and get a free Rust Remover rather than paying for it (personally, I found stocking up on Maple Juices to be the most helpful). Go east until you see a fence, then go counterclockwise around it to the opening. Examine the sparkle to get a second Prajna Keychain, then go north into the Abandoned Building. Examine the metal locker. Might there be a way to get it open? Go upstairs. You might want to save, then go upstairs again. Make your way west along the corridor. When does Ryou leave the group? How can you tell when he's gone? You'll need a certain item to be able to find him. This item can be found nearby. Turn on your sound. When you hear the thumping noise, check to see if Ryou is still in the party. Keep checking as you continue west, and when he's gone, go back east until you find him. Outside the dark corridor, take the south exit to the roof outside. After the scene, Aya will ask to be left alone. Leaving Aya alone isn't a good idea, but declining to leave her alone just keeps her on the roof. What can you do to convince Aya to leave with the rest of the party? The game treats Aya as a party member at this point. Has anything changed in the menu? More specifically, any items Aya was carrying are now in the group inventory. Go to the inventory and "use" the Pistol to confront Aya about her posesssion of a gun. After, leave the building. Depending on what you've done previously, you may need to examine the door on the second floor. Also depending on what you've done previously, Shunsuke may or may not insist on going to the lot with the pipes. If he doesn't, go back to the Secret Base for an ending. If he does, the game continues. Return to the lot with the pipes and examine the open book. You'll arrive... back in Shunsuke's house? You might want to talk to your mother, but it isn't necessary. Go upstairs and talk to the baby, then go back downstairs. You'll now be in the Storybook World proper. Talk to the Santas if you'd like, but you only need to talk to the bunny and say that you've talked to the Santas to progress (the game doesn't care if you lie). Note that if you examine the bed, the answers are reversed-- saying "No" kills you, and saying "Yes" lets you live. In this checkerboard-patterned room, you can examine the mirror to watch a short play about Yuuichi's backstory. After seeing eight of these, the lantern will light up and you can examine it to go to the next area. This next area is full of cherry blossoms. All you need to do is walk north until you reach the lantern. Examine it, but you may want to save first. Shunsuke will talk to Yuuichi, and then you'll have to battle him. Note that Shunsuke says he should wait and see what Yuuichi's up to. Yuuichi's Andromeda attack isn't survivable by Shunsuke if he doesn't block. Block for the first three turns. After that, Yuuichi will stop using Andromeda. Bash him until he's defeated. After the scene, you'll be back in town. The group decides to go to Yuuichi's house, and you'll need to go there in order to progress, but there are a few things you might want to do in town before you go. If you still have any money, this is your last opportunity to buy something at the vending machine. You aren't going to need it for anything else. There are also three tin boxes hidden around town. Collect them all, and you can get an item that'll help you in the final battle. There's no real downside to doing this-- if you'd rather have the challenge, you don't need to use the item. It'll just be there, if you want to use it. 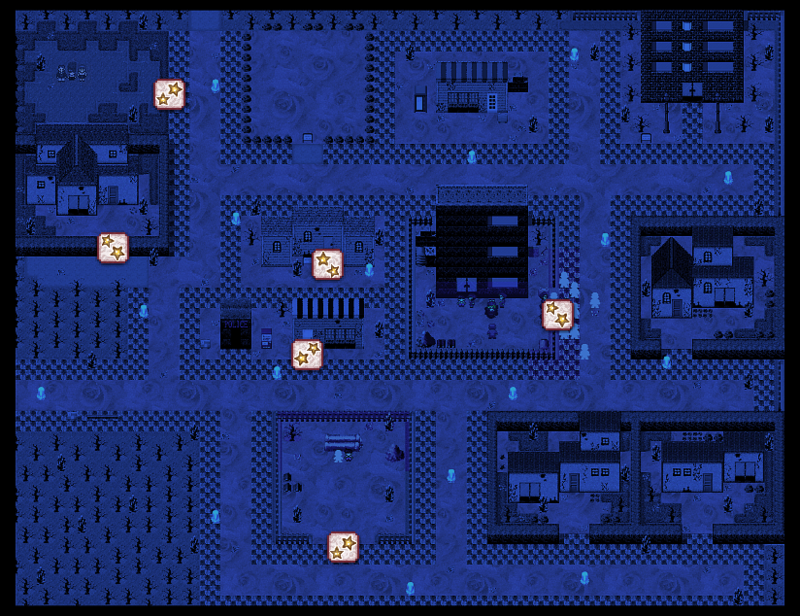 Two Tin Boxes are hidden in buildings, and one is hidden outside in the town. You can't get to the Tin Boxes in the buildings by taking the standard entrances. Both buildings that contain a Tin Box have a secret entrance which you can find through careful observation. To get your prize, you'll need to find a helpful NPC somewhere in the town. Have you checked all the houses? One Tin Box is in the wooded area at the southwest corner of the map. To get to the box, go to the road east of the wooded area, and enter the wooded area just north of the southmost crystal-like tree. Make your way west through the trees, and grab the Tin Box. The second Tin Box is in the Hag's Shop. The hidden door is on the north side of the shop, directly north of the visible door. You'll come out behind the counter, where there's now a visible Tin Box. The third Tin Box is in the Abandoned Building. There's a darker square on the east side of the building, which marks an entrance. This entrance leads to a secret room, containing a Tin Box. 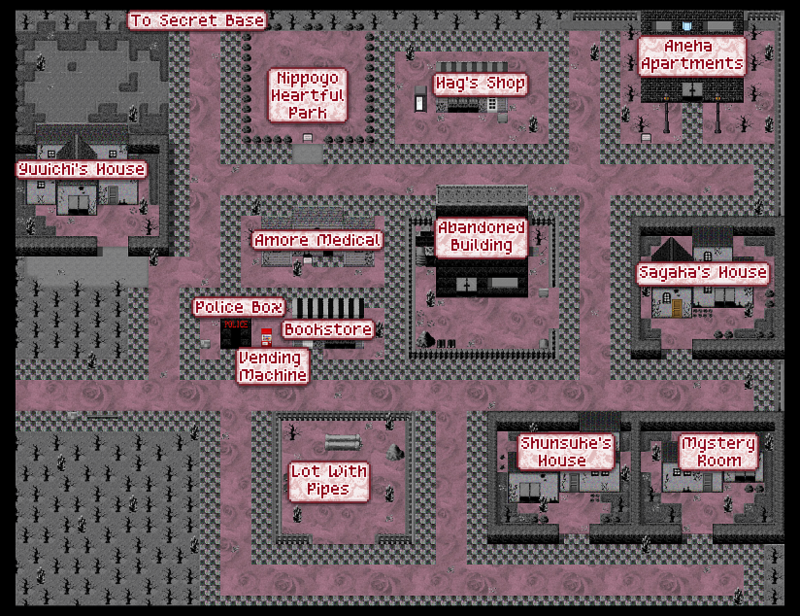 Once you have all three, take them to the Mystery Room, which is the house at the southeast corner of the map. Talk to Mr. Bear, and you'll get an Eternal Force Blizzard, which lets you skip the final battle, if you use it during the fight. Again, having the item in your inventory and not using it doesn't affect the final battle one bit. This image shows how to get the Tin Boxes, and where to take them. Once you're done with everything else, make your way to Yuuichi's house and go inside. Again, examine the computer, and the spikes will drop. You don't need to talk to the cat, but you might want to. After, go upstairs. You might want to talk to the bear, then take the southeast exit. Examine the door. After the scene, it's time to pick your party for the final battle. Saving first is highly recommended. The developer apparently reccomended a party of Hiroto, Rei, and Aya. This is one of the better options, but who you want to take will also depend on how you like to play these battles. Bringing Hiroto along is a very good idea. Yuuichi has an unsurvivable attack that can be stopped by Hiroto's Shout ability, and Hiroto also has the highest attack stat in the group. If you don't want to bring Hiroto, you'll need to bring Aya and have her use Dark Gaze on a very specific turn. Aya can be a good party member, but she's not the best substitute for Hiroto. Only leave Hiroto behind if you've done this before and you'd like a challenge. Bringing Rei along is a good idea if you'd like a more offense-based party. Her ability doesn't do anything, though, and if you'd rather opt for a slower, more careful battle, her slot could go to somebody with a more useful ability. Aya is a pretty good party member to bring. She's immune to some of Yuuichi's attacks, and her Dark Gaze ability can cut the damage your party takes. She doesn't do much damage, though, and her slot could go to one of the party members who heal more effectively. However, if you're not bringing Hiroto, you absolutely need Aya. Ryou can heal, and if you don't have many healing items, you'll want to bring him along. On the other hand, he can't do much else. If you're sitting on a stockpile of Maple Cookies and Juices, you should probably take someone else. Sayaka can heal very well if you've got enough healing items (they're much more effective when used by her), and she can also cure status ailments (which will be pretty useful in the upcoming battle.) She's also, like Aya, immune to some of Yuuichi's attacks. She's a good choice if you've got Cookies and Juices to spare, but if you don't, you're probably better off with Ryou, and you really don't need both. When you've chosen your party, go north through the door. Time for the last battle of the game! Flower Ring Rocket isn't survivable. Did you bring a party member who can stop Yuuichi from using it? Humming of the Night Sky is barely survivable, but not so bad when blocked. Is there a pattern to Yuuichi's use of this attack? Once Yuuichi stops being a threat, do you have an item you could use to calm him down? Bash until Yuuichi gets serious. Once he does, have Hiroto use Shout right away. If you didn't bring Hiroto, have Aya use Dark Gaze so that Yuuichi is affected by it at the start of the third turn after he gets serious. If you didn't bring either, well... sorry, everyone's going to get killed by Flower Ring Rocket. Yuuichi uses Humming of the Night Sky every third turn, starting with the first turn after he gets serious. Aya and Sayaka are immune to it, but everyone else needs to block every time. Have Shunsuke Bash, and if you brought Hiroto and/or Rei, have them concentrate on Bashing too. If you brought Ryou, have him use Share Candy as much as possible. If you brought Aya, have her try to keep Yuuichi under the effects of Dark Gaze as much as possible. If you brought Sayaka, have her use the party's healing items (but only when really necessary) and use her ability to heal the party of status ailments whenever any come up. If you didn't bring either, have Aya use the party's healing items, still only when really necessary. If you have the Eternal Force Blizzard, you can use it to skip this part of the battle. Yuuichi's next phase isn't dangerous at all. He'll only use Campanella, which just stops everyone but Shunsuke from moving. Don't worry about damaging him. Instead, once he starts talking, use the Red Rose Book. At the next opportunity, use the Red Rose Book again. Watch the scene, and then the ending. Congratulations, you've beaten Re: Kinder. There are three endings in Re: Kinder, and they all depend on which characters survive and which characters die. Not counting Shunsuke himself, the characters who can be saved are: Sayaka, Ryou, Aya, Rei, and Hiroto. If you've already saved everyone, that's the best ending you're going to get. Also note that endings occur at different points in the game. The "worse" the ending, the sooner the game gets cut off. Also known as the Ni-chome Mama End. Have everyone die before you leave the Aneha Apartments. Every time an opportunity comes up to save someone, fail. Everyone but Shunsuke is dead, and upon finding Hiroto's body, Shunsuke decides to join his friends in death. Before he does, he's stopped by... Takumi? Now the archangel Takumiel, he takes Shunsuke away from the town and grants him "success in the nightlife" when he's older. Years later, Shunsuke runs a bar in Ni-chome, a famous gay district in Shinjuku, and tells the events of the game as a story for his customers. There are two variations on this end. 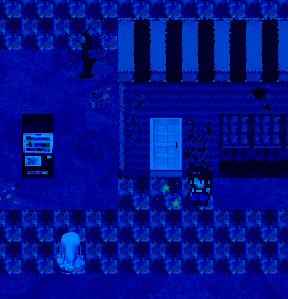 One occurs if you trigger the ending conditions before leaving the Aneha Apartments, and the other occurs if you trigger the ending conditions in the Abandoned Building. Have someone die... but not everyone. Mami and Takumi's deaths don't count, because they can't be saved. For the first variation, have someone die before you leave the Aneha Apartments (Rei and Hiroto count.) For the second, have Ryou and/or Aya die in the Abandoned Building. When Shunsuke's party returns to the Secret Base, Yuuichi will be there, and he'll have decided to call off the Friends Game and send everyone home. In the first variation, Shunsuke will be alone, or with Rei and/or Hiroto. In the second variation, Shunsuke will be with Sayaka, and Ryou or Aya may be there too. In that version of the ending, Sayaka yells at Yuuichi to do something lewd, and you can tell that for all her talk of sperm and affairs and abortions, she's really just a kid who doesn't quite grasp these concepts on an adult level. Either way, Yuuichi sends everyone home. Shunsuke finds his mother alive again, and the world mostly restored to normal. However, nobody seems to remember the children who died, and it's like they never existed. Shunsuke has nightmares about every preventable death, as well as Takumi's, and when Yuuichi comes to see him, Shunsuke murders Yuuichi. Save everyone. Mami, Takumi, and Yuuichi can't be saved, but every other party member can. The walkthrough section goes into more detail about how to keep your friends from dying. 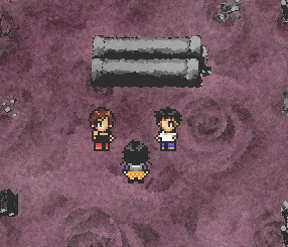 Shunsuke and the others confront and defeat Yuuichi. To Shunsuke's horror, Yuuichi kills himself after the fight. Eventually, the kids are rescued from the town, and because their parents are still dead, they move in with their other relatives and are separated. Shunsuke admits to the player that his kindness to Yuuichi was more of an attempt to be kind to himself, and he resolves to continue to try to be kinder as he grows into an adult. After the credits, Yuuichi wakes up by the lake with his family, surrounded by butterflies. People seem to have different opinions on the meaning of this-- maybe he's dead and this is his afterlife, maybe he dreamed the whole game, maybe he was carried away by the butterflies to an alternate world where he could be happy. It's whatever you make of it, really. Hopefully, you've already seen at least one ending before reading this section! There's a lot of interesting content in this game (particularly, the character deaths and the nightmares in the Killer End about said deaths) that blocks off progress to the end. However, almost everything can be seen in two playthroughs, with minimal backtracking. In one playthrough, go to the Aneha Apartments without saving anyone. Save your game before Rei and Hiroto are in danger, then let them both die to see the Everyone Dies End. Load, then save only Hiroto and see the Killer End (with Rei's death). Load again, then save only Rei and see the Killer End (with Hiroto's death.) The dialogue isn't that different if both of them are alive in that scene, so don't worry about getting the Killer End with both still alive. In another playthrough, keep everyone alive up until the Abandoned Building. Save your game before Ryou and Aya are in danger, then let both of them die to see the second variation of the killer end. The dialogue isn't that different with either of them alive (mostly they're stunned by Sayaka's behavior), so don't worry too much about getting the Killer End with either still alive. Load, then save both Ryou and Aya, and keep going to the True End. Oh, and at some point, try to leave town via the road near the southwest corner. Save first, though. Well that was thoroughly depressing. Oh gosh. So much trolling in this game. Especially when you try to leave the town by "completely ignoring the plot", as the game states. let Sayaka die before the Aneha Apartments? I tried to download Re:Kinder from Vgperson but when I open it I get an error. I downloaded it 4 times but still got the error. What do I do? Hi Sophia. I'm not sure what the problem is without further details. Can you be more specific as to what "error" you're getting? It says: "Cant find RGSSDL3.ii" or something when i open it. Hi again Sophia. Have you made sure you downloaded and installed RPG Maker VX RTP? The link for it is on vgperson's site, and is required to play.